The Lexus IS 250 F Sport sedan is typically seen as one of those vehicles which adorns a flashy sport costume but is far from being gold inside. The exterior makes promises that the powertrain can certainly not keep. The vehicle thus experiences a lot of highs and lows as we examine its minute details from its refined interior to its inefficient engine. Lexus, however claims the latest IS as having “kicked it up a notch with true sport sedan driving dynamics, state of the art on board technologies, and an all-new design that makes it look fast even when it’s standing still.” Unfortunately, most people don’t agree. The IS 250 goes 0-60 mph in 7.2 seconds, the quarter mile at 15.6 seconds with a trap speed of 89.4 mph, and brakes to a stop from 60 mph in 113 feet. The car is powered by a direct-injected 2.5-liter V-6 with 204 horsepower and 185 lb-ft of torque and has an identical gear ratios in the six-speed automatic transmission with the 2011 IS 250. With many competitors sporting the turbocharged four-cylinder engine in this segment of cars, the IS 250’s low-end torque goes a bit off the scope of its competition. The car goes fine until one tries to have some fun and push it to some limits. That is the moment when it is found that the engine feels reluctant to rev, and the grip with the stock tire option really spoils the show. As mentioned at the start, the exterior is the main dreamy part of the vehicle, designed to distract one from its shortcomings under the hood. The wheelbase is lengthened by 2.7 inches, sporting LED headlights, 18-inch five-spoke wheels and a bold version of Lexus’ attractive spindle-shaped grille. While the old IS seemed somewhat reserved, the 2014 IS comes at you aggressively with a wholesome sporty but dramatic look. The interior is the downward stepping stone from the exterior. With many textures and hues to the dash with its multi-contoured surfaces, the inconsistency is just too vague to relish. The car has a high seating position and is easy to enter but the traditional claustrophobic cockpit of the IS is still not affording enough legroom as well as limited storage space. The steering is the prominent feature of the 2014 IS that really is something drivers will relish. It is direct, predictable, and highly responsive. Some people have gone so far as to suggest that it is the best steering in the segment. However when it came to the grip of the tire options, it left much to desire. Nevertheless, the car feels balanced and secure on fast turns and is firm and compliant. The rear end can get bouncy along the road as the suspension really downgrades the firm handling. Hence, when pushed to perform as a port sedan, the 2014 IS just fails to come to the party. 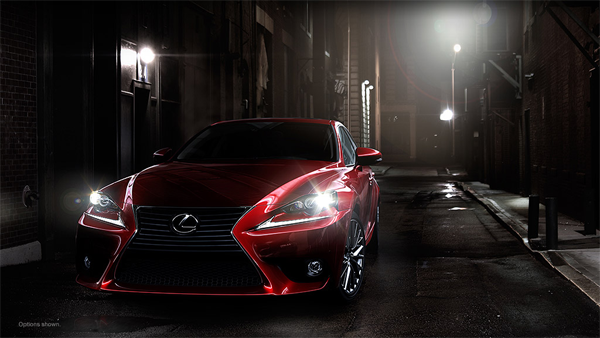 The 2014 IS 250 AWD sedan boasting the attractive F Sport appearance package bears a base price of around $39,000. That is certainly a competitive price given its sporty expensive outlook. However, to get the engine performance such a price tag should offer, one would have to go for the IS 350 instead. The F Sport package is definitely a bargain at $2,675 but seems like too much of a mismatch when coupled with the drivetrain of this particular vehicle. With competitors like the BMW’s M Sport and the Mercedes’s AMG, the Lexus just falls short of the real substance required under the hood for it to drive like a sport sedan, along with looking the part. With a sterling reputation as a writer capable of writing on a range of topics due to his highly diverse interests, Abdullah is currently engaged in online writing for a number of websites with themes ranging from Automobiles.